What makes the S6 Active so tough? The Active measures 5.78 by 2.89 by 0.34 inches weighs 5.29 ounces compared to the slightly smaller S6, which weighs 4.87 ounces and measures 5.65 by 2.78 by 0.27 inches. In addition to the size difference, the S6 Active features all hardware buttons, as opposed to the capacitive touch menu and back keys on the S6 (and most Android smartphones), making it easier to use when wet (or if your fingers are wet). The only feature it lacks is the fingerprint reader found on the S6; this feature not only offers a new way to unlock your phone, but it can also be used with the forthcoming Android Pay and Samsung Pay. The Active is all-plastic: the glass and metal design of other Android smartphones has no place here. It also boasts an extra powerful battery that excels in expert tests, including at CNET. Flip the smartphone over, and you can see the real difference, rather than the shiny back sported by the S6, you get a matte, textured back, which makes it easy to grip and less prone to dents and scratches. The camera lens is also recessed so you don't need to protect it with a case. Otherwise, the camera specs are the same (16-megapixels on the back; 5 megapixels for selfies). The S6 Active is built to withstand a dunk in five feet of water for up to 30 minutes and to survive drops from up to four feet onto a flat surface. It's also protected from dust and extreme temperatures up to a point. The S6 Active gets an extra button, a bright blue Active Key, on the left side. By default, pressing it once brings up the Activity Zone app (more on that in a minute), while a long press pulls up a music app. What's great is that you can customize this button to open any apps you have on your phone; you're not limited to Samsung apps. You can use to launch your favorite music app or a competing fitness app like Fitbit or Endomondo (two of my favorites), or even something not fitness related. The Active Key can also be used as a shutter button for the camera. 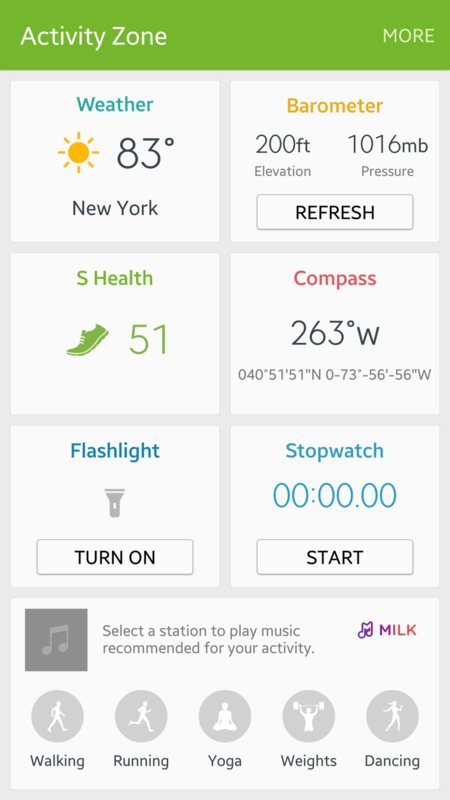 The aforementioned Activity Zone app is a customizable dashboard featuring Samsung apps like S Health, and widgets for weather, barometer, compass, and a stopwatch. There's also an on/off button for the flash light. At the bottom, you can access Milk Music (powered by Slacker Radio) and choose stations based on your physical activity: walking, running, yoga, weights, or dancing.